As previously reported, this past weekend, Matt and I went to Orlando for the NATS National Conference, where Tesla's Pigeon, which won the Art Song Award Competition, was performed on Saturday. We had a terrific time, and I hope I manage to stay in touch with the many wonderful people we met. I couldn't possibly list all of them, but of special note are Carol Mikkelson, the NATS Art Song Coordinator, who is quite possibly one of the sweetest people I think I've ever met, with one of those gentle southern accents I could listen to all day, and Colleen Gray (soprano) and Nanette Kaplan Solomon (pianist), who together performed Tesla's Pigeon. In addition to being lots of fun, they are both quite extraordinary and dramatic musicians who learned the work in record time despite being busy with so many other things. They sold the hell out of my songs in the concert! 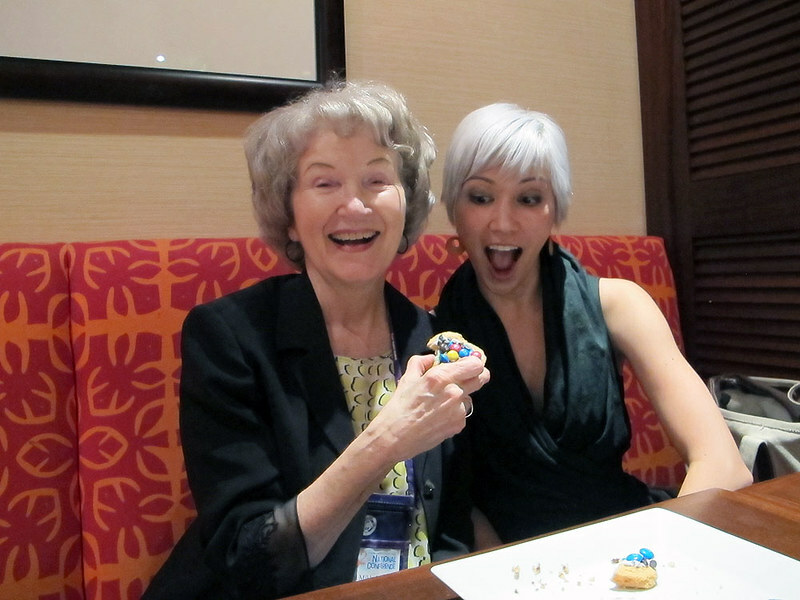 Carol feeds me a cookie. On Saturday morning, I was browsing the booths in the exhibit hall, when I spotted an Australian flag out of the corner of my eye. What's that about? As I drew in closer, I saw a table was stacked with all manner of tourism information for Brisbane. Brisbane!? The city in which I was born and bred? Eh? 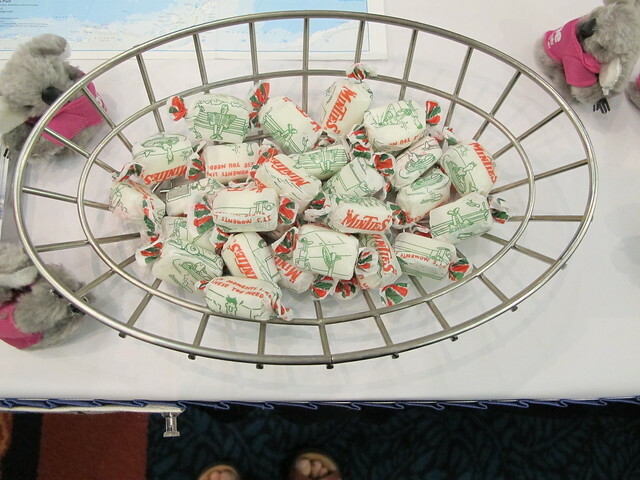 I was so absorbed in trying to figure out why my hometown had its own booth at NATS, I completely missed the basket of lollies to one side. "Mel," asked Matt, "is this Australian candy--?" I'm not sure I've ever been so excited about Minties in my life. I hadn't even thought about them in nearly a decade. For confused Americans: Minties are functionally equivalent to Tootsie Rolls, but white and mint-flavored (and Australian, obviously). It turns out that beloved BrizVegas is the host city for the 2013 International Congress of Voice Teachers next July, and in attendance at NATS were representatives from the Australian Voice Association. I didn't get to properly sit down with them all, but I met the president Jane Mott and had the chance to speak with VP Adele Nisbet, and caught a good case of homesickness talking about mutual friends and haunts. They left me with a bunch of Minties (eating the last one now) and a packet of Aussie flag cocktail toothpicks (expect those to show up at future house parties). The conference was held at the Renaissance Hotel at SeaWorld, so it seemed natural Matt and I should hang out at SeaWorld on Sunday, especially with discounted tickets. I enjoyed myself more than anticipated, and didn't even mind the Florida heat (Philadelphia was simultaneously in the grips of a heatwave that brought worse temperatures anyway). I sort of forgot that SeaWorld is more circus than zoo or amusement park -- and the animals actually do seem to enjoy performing, although I'm sure PETA would disagree or something. They even have one of those troupes of rescued pets that seem to be all the rage at the moment, which of course turned Matt and I into insufferable cat idiots squeeing at all the performing kitties. The biggest squee of Sunday, however, was reserved for a blog comment notification that buzzed my phone in the middle of the seal and sea otter pirate show. One of the highlights of our recent roadtrop was a dinosaur dig we did in Wyoming, and our guide dropped into the roadtrop blog to give us some exciting news about a bone I found at the dig -- see the latest roadtrop entry for details! Now we're back in Philly. I have parts to create for a new arrangement of Jack and the Beanstalk for the Kennett Symphony, and a crapload of laundry to fold. Sigh.